The Witches and Warlocks have always been at war, and now you must step in to end it. Click here to play! They have powerful magics of many kinds, but you have The Artifact. It looks much like a slot machine, with 5 reels and many paylines. The Artifact is a relic of great power, however, and using it you could bend the witches and warlocks to your will to break the millennia long war! 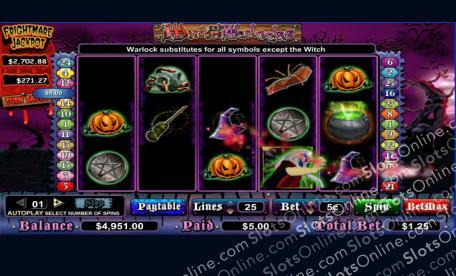 In the Witches and Warlocks slots, you must line up witches, warlocks, cauldrons, crystal balls, and many other occult symbols to defeat the magi of the dark world this Frightmare slot is set in. Conquer the witches for a prize of up to 100 times your bet, or wipe out the warlocks for a prize of 5,000 coins based on the winning payline. Pick up a magic broomstick, a familiar, and a book of spells now to join in the fight! Do you have what it takes to beat the Witches and Warlocks at their own game? The Witches symbol is the scatter, paying out on the total bet when 2 or more land on the reels. It also triggers the bonus game when 3 or more land on the reels. The Wild Warlocks symbol can substitute for any symbol other than the Witches scatter. When 3 Witches land on the reels, the bonus game is triggered. In it, the Witch and the Warlock fight to the death, with the player choosing which to fight as. Every time the opponent is damaged, a prize is awarded. Prizes are awarded according to damage dealt and life meter remaining. All prizes are multiplied by the triggering bet.